نرم افزار xTools Pro توسط تیم king of crackکرک شده است. برای تهیه این نرم افزار یا نسخه های دیگر لطفا با شرکت تماس گرفته یا فرم درخواست کرک را پر نمایید. XTools مجموعه ای جامع از آنالیزهای برداری مفید، ابزارهای تبدیل شکل، و ابزارهای مدیریت جدول برای نرم افزار ArcGIS است که تا حد زیادی قابلیت ArcGIS را افزایش داده و به کاربران نرم افزار ArcGIS سطح جدیدی از بهره وری و عملکرد را ارائه می دهد. XTools شامل بیش از ۶۰ ابزار برای تجزیه و تحلیل برداری، تبدیل شکل، و مدیریت جدول و ۴۰ ابزار geoprocessing است. ابزارهای ضروری در یک نوارابزار برای کاربران نرم افزار ArcGIS جمع آوری شده اند. ابزارهای مفید جدید به صرفه جویی در وقت شما کمک کرده و فرصت های جدیدی را برای کار با داده های جغرافیایی در مقابل شما باز می کنند. The toolset that allows creating new geodatabases, feature classes and tables, creating random points, deleting datasets, changing datasources and also renaming multiple datasets in an advanced way. The series of tools for processing feature classes, including tools for performing various conversions between feature types, for work with multipart features and graphic objects. The tools for performing some basic overlay operations like erase, identity and update, as well as advanced tools for creating intersection points and finding nearest features. The series of tools to effectively manage and enrich your attribute tables with such additional attributes like XYZ coordinates, length, area and perimeter; to export tables to the Microsoft Excel application and other file formats, to aggregate and sort features/records, to delete multiple fields at once, to collect various statistics and restructure tables in many advanced ways. The series of tools for creating surfaces (Grids) from polyline and point data, converting Grids to contour polylines, building Thiessen polygons, and extracting values and zonal statistics from rasters. A huge collection of various general usage tools significantly extending standard ArcGIS for Desktop functionality. There are pretty simple yet extremely useful and handy features like Start Editing Selected Layer, Open Attribute Table or Auto Save MXD, as well as powerful tools like Metadata Editor including batch metadata editing capabilities. 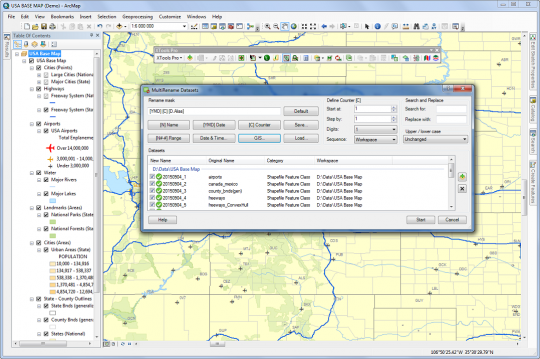 There are more advanced analogs of the standard ArcGIS features like Smart Add Data dialog and there are tools allowing to do things you simply cannot do in ArcGIS without XTools Pro, e.g. Multiple Layouts, Copy/Paste Layer Properties or Map Theme Manager, and many, many more.